Categories > Card Magic > The Bicycle Brand: Is it Really Worth the Money to Get a Bicycle Deck? The Bicycle Brand: Is it Really Worth the Money to Get a Bicycle Deck? A common question from many people new to the world of custom playing cards is about the Bicycle® brand of playing cards. It is a very recognizable and familiar brand. But they tend to cost a little more than a cheap deck at the corner shop or department store. Is it really worth spending the extra money to get something with the Bicycle brand, and are they really better? 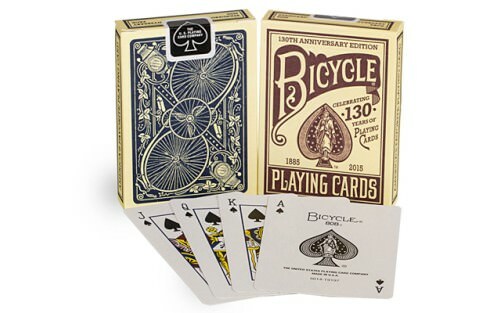 And what about a custom deck of playing cards - is the name Bicycle on the cover any indication or guarantee of quality? As it turns out, Bicycle is just one of the brands used by The United States Playing Card Company (USPCC), which prints the cards. Established in 1894, they have been in business for over a century. Today they are one of the world's biggest producers of playing cards, and certainly the largest in the USA. The famous Bicycle brand playing cards were first produced in 1885, and over time this has become USPCC's signature brand. At the time, high wheeled bicycles were the fashion, and that is what accounts for the name - the company was capitalizing on the popularity of the new bicycle trend. The bicycle naturally became an image associated with the deck and the brand, and it is one reason why even today Bicycle playing cards often have the classic "rider back" design, which typically is printed in either red or blue. Today, inside a standard issued Bicycle deck you can expect to find 52 playing cards with this traditional design, along with two Jokers, plus two extra cards: often an advertising card and a card with the ranking of poker hands. The back design, the Jokers, and the Ace of Spades are signature elements of this classic design, which typically has the number 808 on the Ace and Jokers, identifying it as the classic Bicycle line. 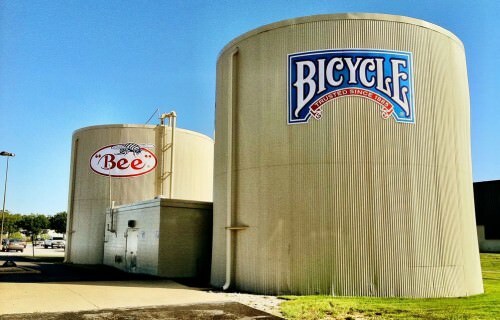 Besides their well-known Bicycle brand, USPCC also prints playing cards for several other well known brands, such as Bee®, Aviator®, and Tally Ho®. Over time, USPCC has acquired and absorbed smaller publishers of playing cards, and many of these brands represent other manufacturers that they have taken over (e.g. Hoyle Products in 2001). USPCC has often continued printing under the names of the established brands that they inherited, even though the card quality of these different brands is now basically the same as their own Bicycle cards. But they are a massive producer of playing cards, and according to one source, if placed end to end, the Bicycle cards made in a single year would warp the earth 7.5 times! 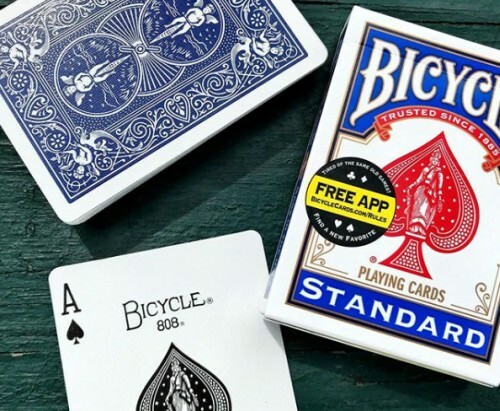 In terms of quality, you can expect a deck of cards with the Bicycle brand on the box to perform similarly to most of the other cards produced by USPCC, including their other brands like Bee and Tally Ho. The reason is that these different labels are mostly about perpetuating other established brand names, rather than any actual difference in card quality or handling. As mentioned above, decks like Bee, Aviator, and Tally Ho - all of which are now registered trademarks of the USPCC - have become popular name brands in their own right, and so it was simply a smart business move for USPCC to keep printing these branded decks under their own labels. Some people will swear that Tally Ho decks are always better than Bicycle decks, and vice versa. In fact, however, the quality and handling today is essentially the same. The actual handling of a particular deck can vary from one printing batch to another, so you can expect to see some normal variance. But this is not a result of a different product for different brands, but is simply normal and accepted variance that you will find within any particular brand as well. Even the Phoenix playing cards produced by Card Shark from Germany, marketed as an ideal deck for magicians, and a deck which some magicians would like to consider as a preferred alternative to the traditional Bicycle rider-back, is actually printed by USPCC, and thus has basically the same card quality. Furthermore, the Bicycle name on the box does not necessarily mean that you will find the "standard issued" Bicycle rider-back cards inside the box. As long as you pay them the right amount of money, if you are having USPCC print a deck of cards for you, they are happy to print "Bicycle" on the box for you. As a result, you will find that some crowdfunding projects for custom playing cards will offer the option of either a "branded" deck and an "unbranded" deck; the branded deck has Bicycle on the box, while the unbranded deck does not. The reason is obvious: putting Bicycle on the box creates an immediate brand recognition, and since the average person associates this name with quality, it can be a good move to have your custom deck produced as a Bicycle deck. But in actual fact, both the branded and unbranded decks are usually identical in quality, since both are printed by USPCC, and it is just a matter of labelling. What you really need to look for is not whether the deck has Bicycle on the box, but whether it was printed by USPCC, which will invariably be mentioned on the box of both the branded and unbranded decks that the creator is producing. The only real difference in handling that the professional cardist might notice is with some older Bicycle branded decks printed by USPCC, and this is a result of the playing cards being produced in a different factory. After operating out of a plant based in Cincinnati, Ohio, for many years, USPCC relocated across the river to Erlanger, Kentucky, in 2009. Along with this move, they discontinued using some stocks, one example being the special "UV 500" stock that was sensitive to ultraviolet/black light (a quality that made the very striking Black Tiger deck from Ellusionist so appealing). But more importantly, printing in a different plant may have also had some small impact on the quality of cards. Bicycle decks produced in the new Kentucky plant typically have a black seal, while Bicycle decks printed in the older Ohio plant can be identified with a blue seal. 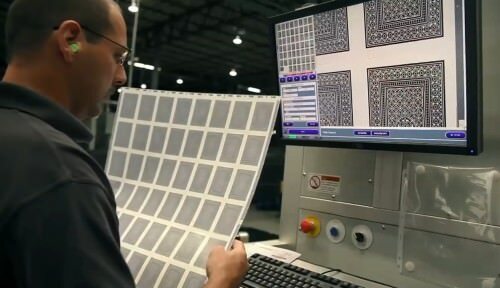 The machines used to print, finish, and cut the cards are different, and some people who are very experienced with playing cards claim that they do notice slight differences in handling, and that they have a preference for the cut or feel of the old decks. In reality any differences between these decks are small, and certainly will go undetected by the average person. There were some teething issues immediately after the move, and during the transition the new machines did create some initial concerns about the quality of black seal decks for a brief period, but those have been long resolved. As a general statement, it can be said that USPCC has continued to produce high quality Bicycle branded cards after their relocation, just as they did before the move. Blue seal or black seal - it does not make much difference in most cases, because both are comparable and high quality products. There is good reason that USPCC is the largest producer of playing cards in the United States, and that is not just because they produce trusted brands like Bicycle, but also because they have a reputation for quality. Besides their Aviator cards that have a smooth finish, all the other brand name cards produced by USPCC have an embossed finish that results in consistent, smooth, and good handling. These are going to be one of the most important qualities necessary for handling a deck of playing cards. In practice, this means that if a custom deck of playing cards is produced by USPCC, regardless of whether or not it has the Bicycle name, it is almost certain to have the embossed texture that they call their "air cushion finish", and the cards will handle nicely. Of course the Bicycle name on the front will tell you that immediately. In the end, the handling of Bicycle decks will not vary significantly from one deck to another, besides the odd batch that might slip through with a lower quality, but that can happen with any publisher of playing cards. The printing and colours of USPCC produced decks is usually good, but there can be one small exception: print registration. This refers to how accurately an image is centred on a card. With wide borders, slight discrepancies will not be obvious, but with a custom deck that has narrow borders, this can be a real problem, and narrow borders can magnify how bad this looks. I have seen this issue occur on quite a few USCPCC produced decks, so it is something to watch out for, especially if you have custom playing cards that do use narrow borders. Of course, with standard decks with wide borders like the Bicycle rider-back, this is usually a non-issue. Some have also expressed a concern that with the high volume of cards that USPCC produces, there can occasionally be a backlog in production at their factory. In order to catch up with the fulfilment of orders, it becomes necessary to speed things up. Since quality control is not always what it should be, this can affect the product that is produced, and unfortunately this can mean that the level of quality in production can vary from month to month, and occasionally a batch of decks is produced where cards quickly clump together, and handle more poorly than they should. Fortunately, however, this seems to be an exception rather than the rule, and I have not seen definitive evidence to support this claim. One nice thing about a Bicycle deck is that you know what you can expect before you open the box. From one deck to another, cards will have the same sort of feel, and the same sort of handling. USPCC does offer three different options of paper stock, namely their standard Bicycle stock, the superior Bee Casino stock (which is thicker), and their new Thin-Crush stock (which is thinner). This mainly affects durability and how "soft" or "stiff" the cards feel, with the thicker Bee Casino stock feeling more firm and being longer lasting, and the thinner Thin-Crush stock feeling more soft and wearing quicker. Premium decks from Ellusionist, Theory11, and Art of Play are often printed with the thicker Bee Casino stock, but the typical custom deck of playing cards will use the standard Bicycle stock, and so decks will perform in exactly the same fashion from one to the next. This makes it very easy to crack open a new deck, because you do not need to adjust to the cards, and will have an immediate sense of familiarity, and the comfort of feeling right at home with a new deck. This is one of the reasons why many magicians prefer USPCC produced decks, because they have become a staple for them, and they do not want to be pulling out a new deck in a performance that will handle in different or unexpected ways, potentially screwing up critical sleight of hand moves. Bicycle is unquestionably one of the most recognized brands of playing cards, at least in the United States. A practical consequence of this is that over time the classic rider-back Bicycle deck has become the deck of choice for magicians to use in performances. One of the advantages of this is that it is immediately recognizable and familiar, and to the spectators, a Bicycle deck immediately sends a message that it is nothing than what it seems: an ordinary deck. Most magicians you see performing on TV specials will typically use the standard rider-back Bicycle deck for this reason. A good magician can perform real miracles with almost any deck of playing cards, but if you do perform magic, often you can find yourself being challenged that you are using a "trick deck". One way to avoid this, of course, is to stick to using a borrowed deck of cards. The disadvantage of this is that you might find yourself using very worn and tattered cards, in some cases where the cards are effectively "marked", and where the cards handle terribly, making it difficult to perform certain sleights. But when one uses a standard rider-back Bicycle deck, there is almost an immediate sense of familiarity, because it is typically seen as the model of a "normal" deck. Using a heavily customized deck can sometimes scream "trick deck", although this perception is gradually changing as the custom playing card industry grows, and as it becomes increasingly common for magicians to use custom decks in online videos and in performances. One other consequence of the Bicycle brand's popularity is that playing cards with the rider-back design are most commonly used for gaffed and gimmicked cards. It is true that sometimes custom decks will come with a couple of gaff cards, especially if they are a deck produced by USPCC, given that their decks normally contain 56 cards, thus including two extras besides the usual 52 cards and 2 Jokers. But gaff cards with the rider-back design are still the standard, and are the ideal "all-rounder" for the magician, because you can immediately slip them into any easily obtainable rider-back deck as needed. All this is not to suggest that Bicycle branded cards from USPCC are the only ones that are a quality product. As mentioned already, other brands printed by USPCC are also high quality, including Bee and Tally-Ho. And an unbranded deck that is USPCC deck will typically also have cards of matching quality. But there are also some other reputable companies that produce high quality playing cards, and the biggest players in recent years include the Expert Playing Card Company (EPCC) operated by Bill Kalush, and Legends Playing Card Company (LPCC) operated by Lawrence Sullivan. These two companies both operate using the same factory in Taiwan, and often will collaborate and even work together. EPCC/LPCC produced decks tend to be just as high quality as USPCC produced decks, although their handling and feel can be different. They offer a number of different finishes, which correspond to different types of paper stock they use. But the feel of their Classic Finish and Elite/Damask Finish decks is quite similar to what you will find in a Bicycle deck from USPCC. Their Diamond/Master Finish and Emerald/JN Finish decks have less embossing than a normal air cushion finish, and also have a thinner stock that is surprisingly more stiff and also very durable. The result is that these cards have more of an oily or plastic feel, and their handling can take some getting used to due to this different feel, but there is no doubt that these are also high quality playing cards. You will see quite a few decks from EPCC/LPCC on crowdfunding projects on Kickstarter, and the EPCC/LPCC label is almost a certain indication of quality. You might just want to check what finish a deck in question is, so that at least you know what to expect. Unlike many Bicycle branded decks that have a modern cut, these decks typically have a traditional cut, which is mainly a preference for magicians and cardists doing faro shuffles, but otherwise irrelevant to the average person. They also have super smooth edges, that make USPCC decks feel rough in comparison. One final strength of EPCC/LPCC produced decks is that their print registration is nearly always perfect, and so they are the ideal publisher for decks that have thin borders, because unlike some USPCC decks, the borders are almost certain to be printed accurately and consistently. Cartamundi is another big name from the boardgame industry that has recently been making a splash in the custom playing card market. Their playing cards are much softer than normal Bicycle cards, and handle much like USPCC's thin-crush stock, so they are great for card flourishing. At the same time they are thicker than a normal Bicycle deck, so they are still very durable. Time will tell whether they will prove to be serious competition for the traditional Bicycle deck. Besides Bicycle decks and those produced by EPCC/LPCC and Cartamundi, there are a few small players in the industry. Ideally you want to stick to decks from these industry leaders to be assured of high quality. In contrast, cheap playing cards that are typically sold in corner shops, department stores, or tourist outlets, are noticeably inferior. To begin with, many of these decks are narrower bridge size cards, rather than the wider poker size cards that are standard. They are typically printed on inferior and thin paper stock, so they will bend and get damaged easily. They usually also have no embossing whatsoever, and as a result they will not fan or spread evenly, and cards will quickly clump together. Do not bother with these if you want decent handling and durability - stick to USPCC decks like the Bicycle brand, or those of other industry leaders like EPCC/LPCC and Cartamundi. As the old saying goes, you get what you pay for! If you buy a cheap non-Bicycle branded deck from a corner shop, you are likely to get an inferior product that will quickly wear out, and even make for an unpleasant handling experience. Certainly the magician and cardist will want to stay far away from cards like these! In contrast, the Bicycle brand is a guarantee of quality. While there are also other reputable publishers like EPCC/LPCC and Cartamundi, Bicycle is certainly the brand of choice. Any deck of custom playing cards that is produced by USPCC, with or without the Bicycle brand on the tuck box, is almost certain to have a quality that you will be very pleased with. For someone starting out in card magic or card flourishing, I strongly recommend starting with a standard Bicycle deck. It will cost you a bit more than a typical corner store deck, but it is well worth it. In fact, a classic rider-back deck will cost you far less money than a deck of custom playing cards, and yet will usually handle the same. Given their popularity, it is the perfect deck for the budding magician or cardist to begin with. Of course custom playing cards work just fine for magic and cardistry too. But these typically cost more because you are paying for the unique artwork and stylish customization which is the very reason for their appeal. There is a wide range of custom decks that will cost you more money than a basic Bicycle rider-back deck, but those are mostly geared to the collector or the person who enjoys customization, and there is a growing number of great decks with artwork optimized for cardistry. Do not believe the hype that the quality of a custom deck is so much greater than a Bicycle deck, because in reality they perform and handle the same, and the extra cost is primarily about the customization in artwork, and often a more luxurious tuck box. Of course if it is a custom deck with the Bicycle brand, it will be a quality product, and that means that it will not only have the visual appeal that you want, but it will also perform at a level that you need for magic. As the old adage says, the bad workman will always blame his tools. Even the best deck in the world will not make up for the other essentials of good magic or skilful card flourishing, both of which require sound and well-practised technical skill with cards, and in the case of card magic, also good patter and presentation. But if you are going to try card magic or card flourishing, it is going to be a much more satisfying experience for everyone if you have a decent deck in your hands, and that is exactly what you are getting with a Bicycle deck. For most people, regardless of whether you are looking for a deck for card magic, for card flourishing, for playing card games, or for collecting, it is a good idea to stay away from those cheapie corner shop decks. These will quickly wear out and become a mess, and only disappoint in the end. At a minimum, spend a little extra and get a standard Bicycle deck. And if you are looking for a custom deck, the Bicycle name is an assurance of quality, as is almost any deck produced by the United States Playing Card Company. So is it really worth the money to get a Bicycle deck? If quality is what you need, then absolutely! Where to get them: Do you want to pick up some quality Bicycle decks? Look no further - you can get them at PlayingCardDecks.com. Start with the tried and true classics: the Red Rider Back and the Blue Rider Back. Or perhaps you might enjoy a variation of the Rider Back deck in one of many other colours or styles. Alternatively, to see the massive full range of playing cards with the Bicycle brand, check out their complete online catalogue of Bicycle Playing Cards. Join the discussion: What do you think of Bicycle Playing Cards? And are they worth the extra cash? I like 'em too. They're ubiquitous, so no one eyes them with suspicion. "Oh, are those magic cards?" They're inexpensive. And with rare exceptions they are high quality and ready to go right out of the box. I always run the four edges of a new deck along my jeans a time or two to sand away any burrs, but beyond that they rock. I found that the cheap bicycle cards I used to get from Costco became unusable really quickly. They seemed to lose their air finish and clump. I now love Phoenix cards and have also recently found Copag 310 cards which are beautiful to handle. Phoenix cards and Bicycle cards are both printed by USPCC, so it must just be the difference between print runs. Copag 310 cards are printed by Cartamundi, and are much thicker and softer, so they will handle quite differently. But they are nice cards, I've been quite impressed with them so far.